Is known as Fiddlers’ Green. With friends at Fiddlers’ Green. And go to Fiddlers’ Green. Fiddlers’ Green is the legendary afterlife imagined by Cavalrymen. Its origins are obscure, although some point to the Greek myth of the “Elysian Fields” as a potential inspiration. According to the Cavalry Journal, “Fiddlers’ Green” was inspired by a story told by Captain “Sammy” Pearson at a campfire in the Medicine Bow Mountains of Wyoming. Having mentioned Fiddler’s Green and found that no one appeared to have heard of it, Pearson indignantly asserted that every good cavalryman ought to know of Fiddlers’ Green. Another legend has it originating in the 1800′s and was composed as a song sung by the soldiers of the 6th and 7th Cavalry. It is still used by modern cavalry units to memorialize the deceased. The name has had other military uses. Today, in the heart of the Helmand River Valley, in Helmand Province, Afghanistan, the U.S. Marine Corps operates a firebase (FB) named Fiddlers’ Green. 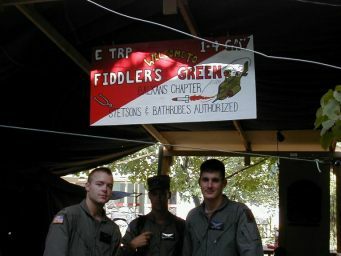 Fiddlers’ Green was also the name given to an artillery Fire Support Base in Military Region III in Vietnam in 1972 occupied principally by elements of 2nd Squadron, 11th Armored Cavalry. “A cavalry soldier passed on the Stetson and Sword today. Boots at rest … taps echoed once again. “A Cavalry Soldier stepped off a “Winged Horse” today. with honor forged on infinity’s wall. This poem was written and generously donated by Thomas J. Criser – SGT, who served in Vietnam 1/69-4/70 ‘Cavalier Blue India’ – If you wish to use it, please contact Mr. Criser. We have lost a great many Troopers over the years, and here is a place to pay tribute to them. If you would like to honor a fallen soldier, leave their name or a message, please post it below. Army Sgt. Nicanor Amper IV, 36, of San Jose, Calif.; assigned to the 6th Squadron, 4th Cavalry Regiment, 3rd Brigade Combat Team, 1st Infantry Division, Fort Knox, Ky.; died July 5 in Khowst, Afghanistan, of wounds suffered when enemy forces attacked his unit with a rocket propelled grenade. Sgt. Amper IV of San Jose took pride that his first name had a biblical origin meaning “victorious.” He lived his life protecting others, especially those who couldn’t help themselves. Amper’s first name comes from the New Testament. Nicanor was one of the seven “honest men” in the Acts of the Apostles. He was a Cavalry scout on his first combat deployment. Amper began his military career as a Marine rifleman in 1995 before transferring to the Army in 2005. He was assigned to the 6th Squadron, 4th Cavalry Regiment, 3rd Brigade Combat Team, 1st Infantry Division, Fort Knox, Ky. He was on his first combat deployment. SGT Amper leaves behind a wife and two sons, 7 and 9. My son, SP4 Hoby F. Bradfield Jr departed for Fiddlers Green on Friday 08 July 2005. He was a Cavalry Scout with Grim Troop, Second Squadron, 3rd ACR in Tal Afar Iraq. He will be deeply missed by all who knew him. Scouts Out. Please be so kind to honor my dad: Col (ret) Raymond H. Beaty who now rests in Fiddlers Green. He always said that was where he was going. I have set up a findagrave.com memorial for him which also includes my poem ‘Welcome Home’ which is about Fiddlers Green. It is the last thing he heard. A tear rolled out. Dad was very brave and remarkably capable. Thank you. Don’t know if you have him there yet, but CPT Dave Boris was lost a little over a year ago in Afghanistan. Never have I met a finer officer, and more professional Cavalry Trooper in my life. Please add SGT Arnold Duplantier II, Member of H- Troop, 18th CAV BRT, attached to 1/184th IN and 3 ID for OIF3. Born in Fiddlers Green by Sniper on 22 June 05 at Grid MB 4479-7994. May he rest in peace. “It is with overwhelming sadness – but great pride – that I submit my husband’s name to your roster of fallen heroes. years’ military career, encompassing WWII, Korea and Vietnam, his devotion was to the 6th U.S. Cavalry. God Bless he and his many comrades. It has been a little while, but I want to add the name of Sgt Eric Snell, who was killed by small arms fire 18 June 2007 in the Rusafa district of Baghdad. Snell was everything a man, soldier and friend should be. There is no way to express the lives he touched and the pain left in his passing. One day I will see my friend again at Fiddler’s Green…until that day, we will always remember the OG. I am sad to tell you that another Cav brother has fallen in combat. His name is SGT Shawn M. Dunkin. He loved the Cav and the Army. A great leader, The finest soldier, and the best husband!! He will be missed by all. We love you brother see you at the green!! The 3rd Squadron, 61st Cavalry Regiment lost three great Troopers in Baghdad. On 20 January 2007, PFC Allen Jaynes was killed by an IED and on 25 January 2007, SGT Alexander Fuller and SPC Michael Balsley were killed by an IED. All three men served proudly as Cav Troopers every single day they were on duty. They’ll all be waiting for the rest of us at Fiddler’s Green, yet they got there way too soon. Furthermore, I’d just like to add that I hope the trail to Hell is a short one. Since Fiddler’s Green is halfway there, I want to be close enough to hear the screams of the cowards who killed my friends. - We will meet again my friend At Fiddler’s Green. You will be missed by all. SGT Ryan D. Jopek was a great Trooper and an even greater friend…the kind of guy who could always make you laugh, and the kind of attitude that could always make you feel better. Unfourtunately, SGT Jopek rode on to Fiddler’s Green this last summer (2006) when a coward with an IED decided to attack his HMMWV. He never saw it coming. SGT Jopek will be forever missed by friends and family. (Ryan – Everyone misses you and we will all see you at Fiddler’s Green). A Cav trooper has fallen. Sgt Craig Nelson died Dec 29 from wounds he received from a IED near Baghdad earlier that month. On Saturday, September 10, SGT Nicolas Bussard, a Cavalry Scout in HHC 1-125 INF (M) was killed in a motorcycle accident near Ann Arbor, MI. A good troop and outstanding leader, Nick earned his spurs while deployed as a member of the Multinational Force and Observers. His esprit de corps and sense of humor will be sorely missed. Rest easy, buddy and wait for the rest of us at Fiddlers Green. Pvt Kurt Russel Frosheiser, a Cav Scout stationed with 2/6 in 1 Armor division, died in 08 Nov 2003 after receiving shrapnel wounds from an IED blast south of Bagdhad. Spc. Clarence “Johnny” Cash, 19D – 4/66 AR – Kuwait, February 27, 1991. He was a good man and is still remembered by his comrades. These men were killed 27 May 2005, crashing their OH-58D helicopter as a result of small arms fire. ST. PAUL – Matt Lourey always wanted to fly. He dressed up as the Red Baron for Halloween. He played with toy helicopters as a child in northern Minnesota, and later, he enlisted in the Marines but left when he didn’t get to fly with them. His dream and sense of duty eventually led him to Iraq, where he flew Kiowa Warrior helicopters with the Army’s 82nd Airborne Division. Chief Warrant Officer Lourey, the son of state Sen. Becky Lourey, died in Iraq Thursday when his helicopter was shot down. The 41-year-old became the 22nd Minnesotan to die in the Mideast during the Iraq war. Earlier this year, he volunteered for a second Iraq tour even though his parents and siblings opposed the war and tried to talk him out of it. I would like to post the names of two fallen former CAV TROOPERS of the E Trp. 238th CAV. They both served the Cav with honor. Last year they both took higher positions in the Brigade. Both will be missed very much. On 27 MAR 05 while on a recon mission supporting the ANA (afghan national army) their vehicle struck a AT mine. CW2 Blaise died when his OH-58 Kiowa Warrior helicopter crashed on its way back from a combat mission near Mosul in northern Iraq. He was assigned to Banshee Troop, 2nd Squadron, 17th Cavalry Regiment, 101st Aviation Brigade, Fort Campbell, Kentucky. CW2 Blaise, a Pilot-in-Command, died on January 23, 2004. In his memory, a tree was planted at a ceremony in front of 2-17 Cav Squadron headquarters, just prior to the unit leaving for Iraq a second time. The Squadron Tactical Operations Center in Kirkuk, Iraq was also renamed Blaise Hangar in his honor. http://www.blaisenatrail.com/ Blaise’N’ A Trail is a memorial bike ride that was named for CW2 Blaise, an avid rider. The ride has grown into an annual memorial ride that honors a different fallen solider each year, with a new destination. Pfc.Rey D. Cuervo, 24, of Laguna Vista, Texas. Cuervo was on a mounted patrol in Baghdad, Iraq when an improvised explosive device hit his vehicle. He was assigned to 1st Squadron, 2nd Armored Cavalry Regiment. Died on December 28, 2003. Pfc.Clayton W. Henson, 20, of Stanton, Texas. Henson died when his convoy was ambushed in Dwaniyan, Iraq. He was assigned to 1st Squadron, 2nd Armored Cavalry Regiment. Died on April 17, 2004. You two will never be forgotten, Henson you were a 11C by MOS but A Scout by Heart and Nature, you went down fighting for us, Cuervo, Strip said the 49ers will do better next year! You guys are still missed and will always will be remembered. On April 28, 2006, we lost two brave cavalry warriors. Please add SFC Bryant Herlem and SGT Jose Gomez to your page. I am Spc. David Thompson and just returned from Iraq and I ask that you add a buddy of mine to your page.His name was SGT. Robert Wesley Tucker. He was a scout with the 278th ACR in TN. He was lost on Oct. 13th 2005. Thank you for honoring our fallen brothers. All members of 3d Sqdn, 5th Armored Cav., 9th Inf Div – Will link up with ‘em again at Fiddlers Green some day. In memory of PFC William Thorne, killed on 24AUG06 Baghdad, Iraq. Thorne and I were battle buddies in basic. Thorne was a good friend and a great Scout, we will all miss you. GHOSTRIDERS, from all of us 3rd plt Bravo Troop 5-15 Cav. We’ll all meet again at the green brother. What you’re doing here is a good thing. Members of the 1st Cavalry Division who have paid the ultimate sacrifice serving their country in Operation Iraqi Freedom. http://www.armyaircrews.com Dedicated to the men and women of the United States Army’s Aviation Branch who paid the ultimate price for freedom and liberties enjoyed today by all Americans, and to their families.